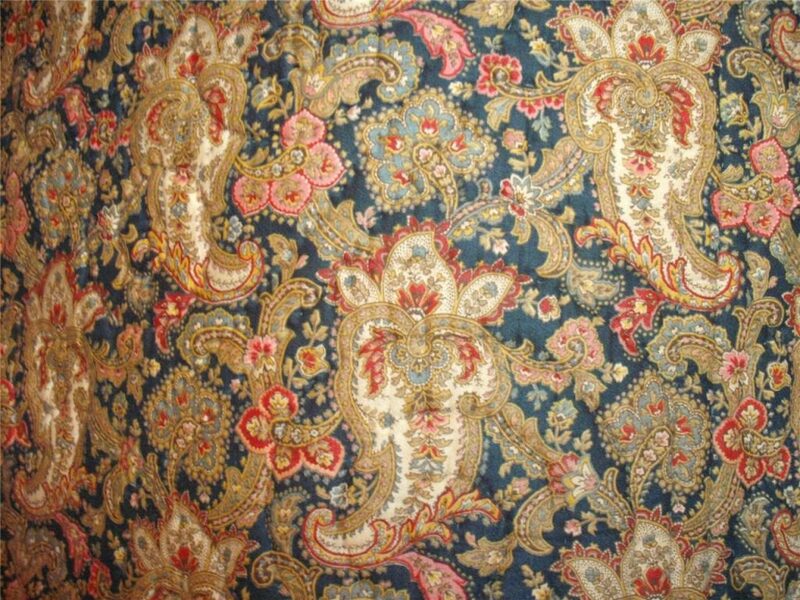 When I first saw this so-called “English” quilt listed on Ebay, nearly all of the photos showed the paisley patterned side – which though attractive, is far too busy to reveal the quilting designs. Only one photo showed a corner of the plain petrol blue side – but these spirals were instantly sufficient to identify it as Welsh. 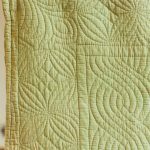 As good Welsh quilts don’t come on the market that often, I was able to successfully bid for it without much competition! 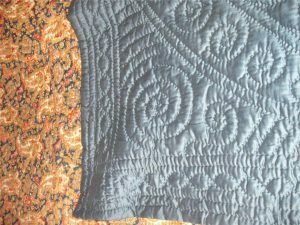 When the quilt arrived, it was clear that the speculative prediction had paid off, as it is stunning. 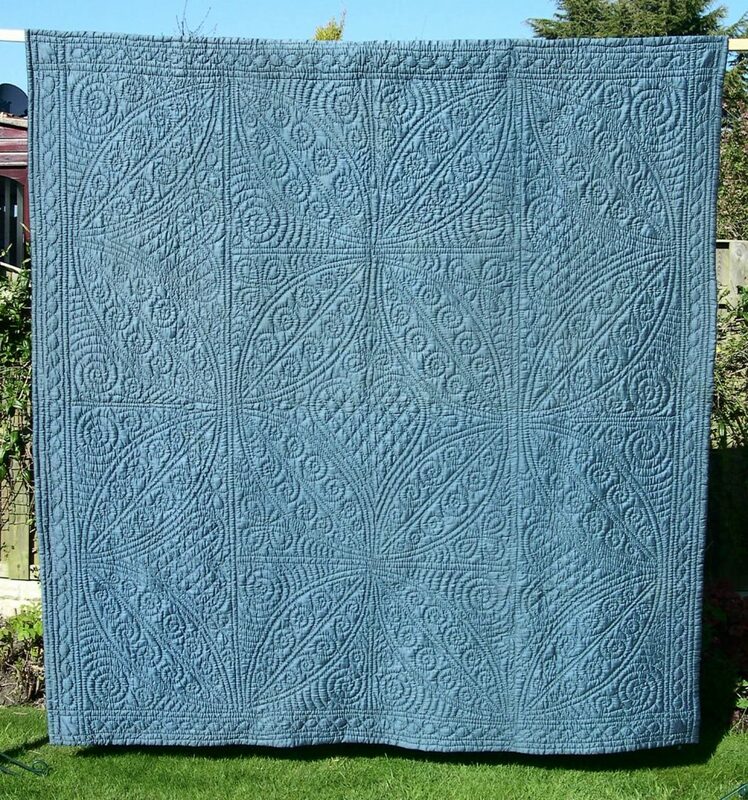 This double wholecloth quilt (231cm x 211cm; 87” x 82”) is beautifully made from heavy, petrol blue, cotton sateen on one side, and a lovely blue paisley fabric on the other. The thick, lambswool wadding allows the large, bold motifs to show in high relief, giving a richly textured surface. Unusually, a directional motif – a large, double lined central heart filled with a diamond grid, forms the central motif. 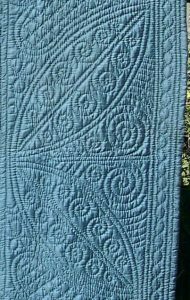 Four large leaves with a spiral infill form a circle around this, and these motifs are repeated in wide borders before a small cable within double tramlines forms the outer edge. Additional large spirals and clover leaves fill any spaces. 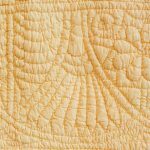 The butted edge is not secured, as is common with a line of running stitch, but is slip-stitched together. Little provenance was available from the New Forest vendor, other than that “it came from a very affluent well travelled local ‘Lady’, in Lymington”. Although the spirals clearly identify it as Welsh in origin, the framework is less rigid than the typical “central ‘coin’ with three borders” designs commonly found, leaving some uncertainty about its likely date and exact origins. 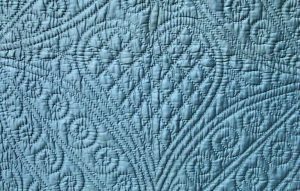 The high quality of the stitching and pattern drafting also set it apart from many humbler quilts – the design is beautifully balanced, and the spacing of the spirals is very even, with the quilter having no trouble stitching them either clockwise or anti-clockwise. 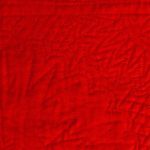 It is possible that it was made by a quilter associated with a scheme run by the Rural Industries Bureau in the 1930’s, which encouraged the production of quilts for a luxury market, sold through a few exclusive outlets in London. 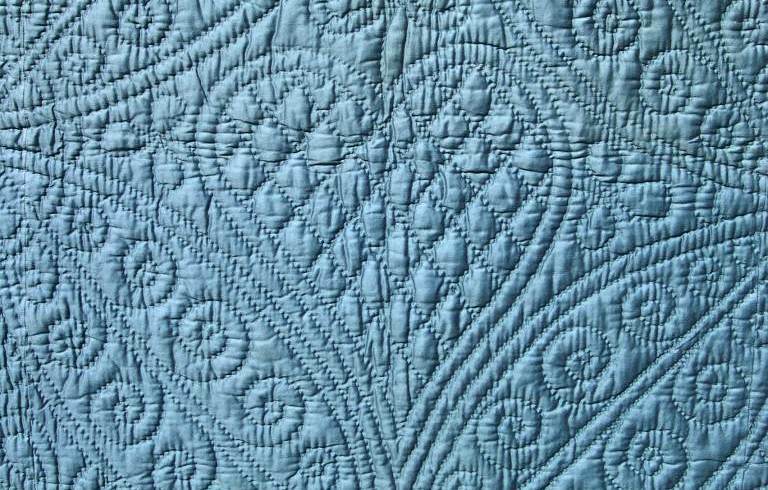 Certainly RIB Welsh quilts made at this time often had large, bold motifs. 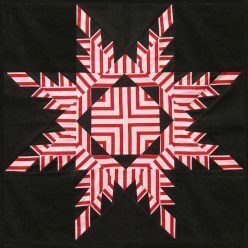 However, as the RIB did not use patterned fabrics, and these particular designs are not known on other RIB quilts, Clare Claridge, a well-known researcher on Welsh Quilts, has suggested that this quilt might have been a private commission. Hazel, one of Jen Jones’ team at the Welsh Quilt Centre in Lampeter has helpfully pointed me towards three of their quilts from Ceredigion and Carmarthen which have similar (but much smaller) spiral-filled leaves, indicating that this quilt is likely to have come from the same region of Wales – they also suggested a date of 1930-40 after looking at the photos. The fabric on both the front and the back is pieced from three strips of fabric 27” wide. 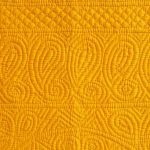 This was the standard width of fabric made up to the very early years of the twentieth century, when improved technology made wider looms possible – so this could possibly point to an earlier date for the quilt. 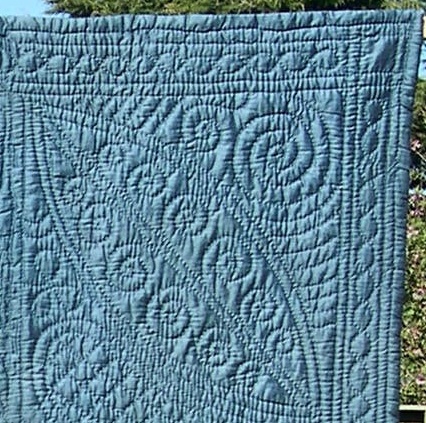 Whatever its origins, the quality makes it one of my favorite quilts.